The so-called “red tide effect” most likely is to blame for a year-over-year drop in collections for the first report on Tourist Development Tax revenue for the 2019 fiscal year. Figures just released by the Sarasota County Tax Collector’s Office show the total “bed tax” revenue reported for October was $1,009,322.61, compared to $1,147,576.14 in October 2017. The difference — $138,253.53 — represents an approximate decline of 12%, according to The Sarasota News Leader’s calculations. During an Oct. 23 public hearing on a proposed change in Tourist Development Tax (TDT) allocations to pay for repairs needed at Ed Smith Stadium, a number of business owners lamented the loss of tourism because of national reports about red tide killing tons of fish, as well as mammals such as dolphins, during the summer. As recent as early November, when offshore winds were pushing the current red tide bloom closer to shore, people on Siesta Key told the News Leader they were experiencing some of the respiratory effects produced by the algae that causes red tide. However, those reports indicated the problems were not nearly as bad then as they were in August. In spite of the national coverage of red tide in the latter part of the the 2018 fiscal year — which ended on Sept. 30 — the county saw overall TDT collections climb about 6%, compared to the final figure for the 2017 fiscal year. 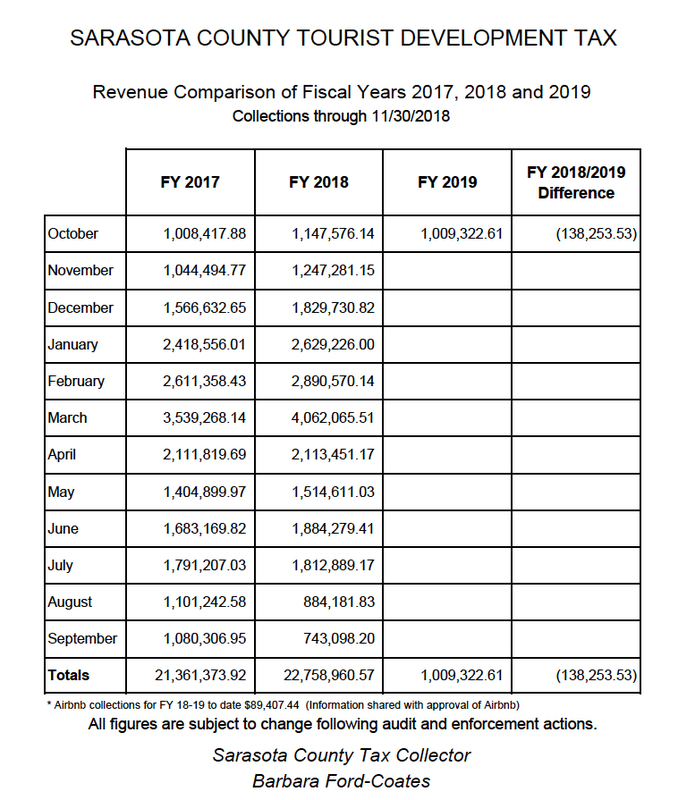 The latest report from Tax Collector Barbara Ford-Coates’ staff shows the 2018 fiscal year revenue total was $22,758,960.57, whereas the final figure for FY 2017 was $21,361,373.92. Both the August and September reports showed less revenue than in the same months during 2017. As Ford-Coates has pointed out on numerous occasions, staff audits and other measures that lead to revisions of data submitted to her office can change totals month-to-month. That statement once again is underscored by the latest report. For example, the October data show that the collections for September added up to $743,098.20, whereas the report the previous month put the figure at $732,643.21. Material county staff provided to the County Commission earlier this year showed that since the board increased the TDT tax to 5% in the 2012 fiscal year, the average climb in total revenue year-over-year has been more than 5%. The 20-year average for increases in TDT collections was 4.85%, staff said on Aug. 22. The tax is charged on rentals of accommodations for six or fewer months. On Sept. 17, Haley told members of the county’s Tourist Development Council that that the county would see an addition of 1,177 hotel rooms by the end of this year. That represents a 23% increase, she said. In her Nov. 29 email, Haley added that the average room rate in October was down 15.4% year-over-year, to $108.67. 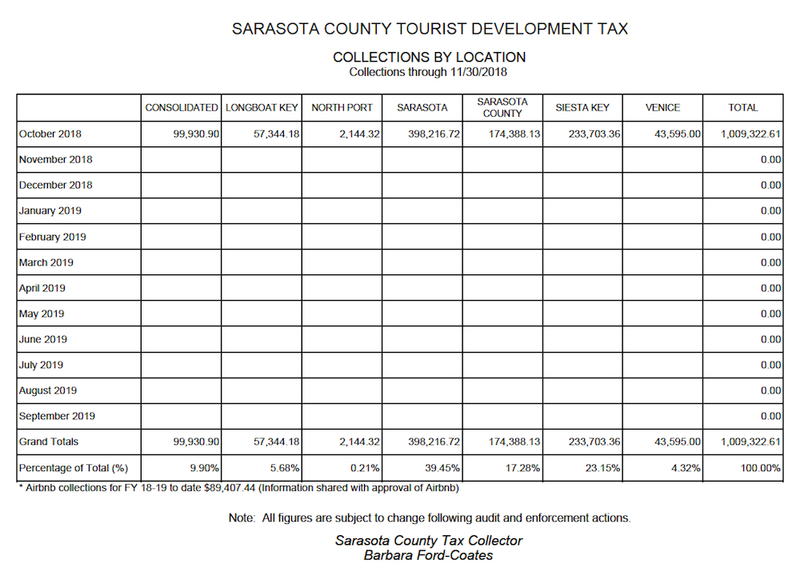 Finally, in regard to the latest report from the Tax Collector’s Office, data show that businesses and property owners located in the city of Sarasota that rented accommodations in October accounted for the largest amount of TDT revenue to start the new fiscal year, by location. They were responsible for 39.45% of all the TDT collections in October. 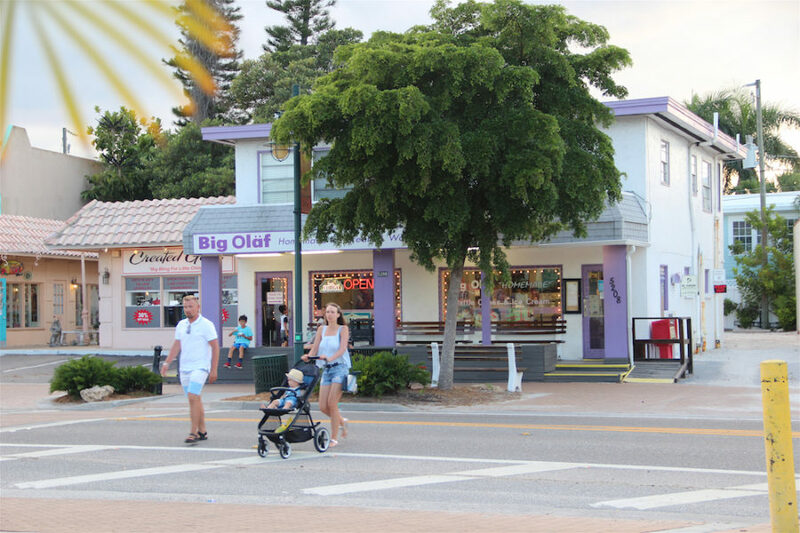 Siesta Key businesses and property owners were in second place, with 23.15 %. Traditionally, the city remains ahead of Siesta until the latter part of the year. Siesta has “won” the informal competition the past several fiscal years.